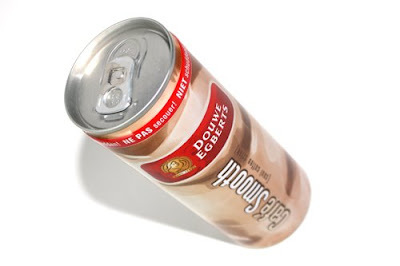 Canned coffee beverages are not that new, the first time I ever drank or came across was in Hong Kong from the brand Pokka which is a very good one and nice to drink cold coffee, because Hong Kong is very warm and be rather drinking cold coffee than a hot one in hot weather. I had drank allot of those coffees but allot of them the were made by European companies were really bad and awful. But this one was pretty well but not the best one though. The asian version by Pokka and Nescafe are much better. One odd thing was that this can was places on high pressure, also have a big warning not to shake this can at all, however there are no carbon in the drink it self though. The can design is that really that great. The mix of red and brand is not really helping, and not sure why they use this color and design, because the normal packaging for other coffee they got looks very good. If you put this can between the other products you can't see it mix or blend together. They should have made the design to be the same as the other packages. Also it is hard to see what target market they are aiming, because most coffee drinkers are old or business people this can is not really aiming at them at all. While they other product they got does. I think a restyle would be good however in the Dutch supermarket they don't have much competitions though. However there is one brand which does it much better called Cafe Fresco and also taste much better and have more flavors.